Today I want to chat with you about intuition and how we often think that if our intuition tells us to go for something in life, that the green light must therefore mean we are either meant to get or have the thing – whatever it is – and/or that it must mean it’s going to be good (as in, what we imagine ‘’good’’ to be). But have you ever been left scratching your head when intuition told you to do something – pair up with an intimate partner, buy a house or car, go to an event, take that job or make that leap – and then it didn’t turn out the way you imagined it would? How did you react to that? Did you go into mistrust of your intuition – or wonder if you read the signs wrong? I’ll admit that a couple of months ago I myself had to frown and wonder why the hell we’d been sent to this home when so much building work had taken place in it over the 14 or so months. But this week I am writing to you from the glorious deck of the luxury 3 bed penthouse that we have been temporarily rehoused in, while repairs at our normal home move towards their completion. And as I type, my face is tingling with the faint spray of salt in the wind from the ocean, and I’m half-watching the waves break on the beach that’s stretched out a few steps from our front gate. 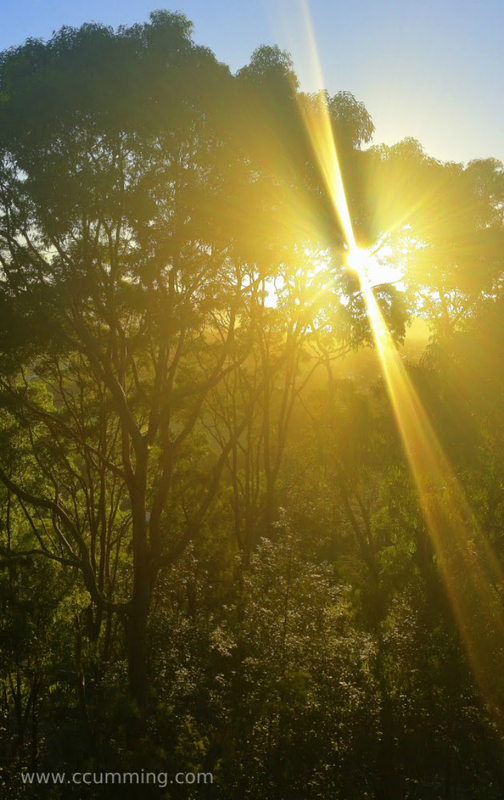 Having a change of space, pace, and a more than welcome reprieve from the intense and challenging building site reality we have been living through, has allowed for much inner processing of all that has been taking place. Including the pondering about why indeed intuition sent us to live at The Eagles Nest. I’ve come to realise that the guiding light of intuition – or whatever else you want to call it – really is a very clever phenomena. Landing a ‘’just-in-time’’ perfect venue for Gordon’s 60th birthday surprise gathering – and one in which we celebrated well. Gordon’s first ever art studio – a place where he could claim his inner artist, and be prolific at a time when the art has really wanted to flow through him. A fabulous array of gallery-style walls – enabling Gordon to fulfil a vision of infusing our home and sacred space with the amazing energy of his paintings. A beautiful office, Skype, and clinic space in nature – one in which clients have healed, been mentored, and opened their hearts. The quietest home we have ever lived in – at a perfect time for the editing of my book. A fantastic baker’s oven – enabling Gordon to practice his artisan craft of sourdough bread with love, and so fulfill a step in a much larger vision. A superb spa bath for two – a magical space in which to enjoy our journey into tantra. The chaos of repeated building repairs – leading to a strengthening of compassion, tolerance, standing in our power, speaking up and out, and to a deep healing of childhood trauma related to the home. The experience of being rehoused in a penthouse across the road from our favourite beach – an opportunity to see how fast manifestation really can be, and to experience that we are breaking through old dynamics. The start of writing my next book – its central theme triggered by some of what I have lived through and healed for myself in this house in recent months. The beginning of a new adventure unfolding – as a way becomes obvious to line up with some land sooner than we thought, and we step into creating the long-held and beautiful vision relating to that. No wonder intuition, or Life, or the Divine guided us to this house! There were all kinds of treasures to unwrap here. A ride waiting for us to strap into. A series of adventures to unfold. I share this simply because we can sometimes run the risk of assuming that because our intuition told us to go for something or do something, that things should then ‘’go well’’ in the ways we want, that they should remain ‘’good’’, and that nothing will ‘’go wrong’’ in the way we define this to mean. In other words, we subconsciously expect that the result should look like a smooth ride, with no so-called upheaval, and nothing to ruffle our feathers – and all because intuition had a hand in things and so we decide the venture must be ‘’blessed’’ in some way, and thus will be exactly as we want it. The reality can look a lot different. That’s because intuition, or soul, or Life itself – whatever we want to call it – always takes us to what will serve the highest expression of our evolution. And it takes us not only to what we would consciously love or want, but also to what we might need at a deeper level. Neither we nor our intuition are ever really off-track, or going wrong, or going right. And in fact, what if Life simply…IS? And in the perceived, so-called ”in-between”, is the ride? ← time to voice it – how about you?